Modelling using scenarios developed for the Arctic Climate Impact Assessment (ACIA) indicates that the annual mean temperature will continue to rise throughout the Arctic. The rise is roughly estimated at 3–5°C over land and up to 7°C over the sea by the end of this century. Winter temperatures are expected to rise considerably more, by about 4–7°C over land and 7–10°C over the sea. Temperatures are likely to rise most over land close to sea areas where a considerable reduction in sea ice cover is expected, for example in northern Russia. Since the early 1960s, most glaciers and ice sheets in the Arctic have retreated and their volume has shrunk. This trend became more marked in the 1990s. 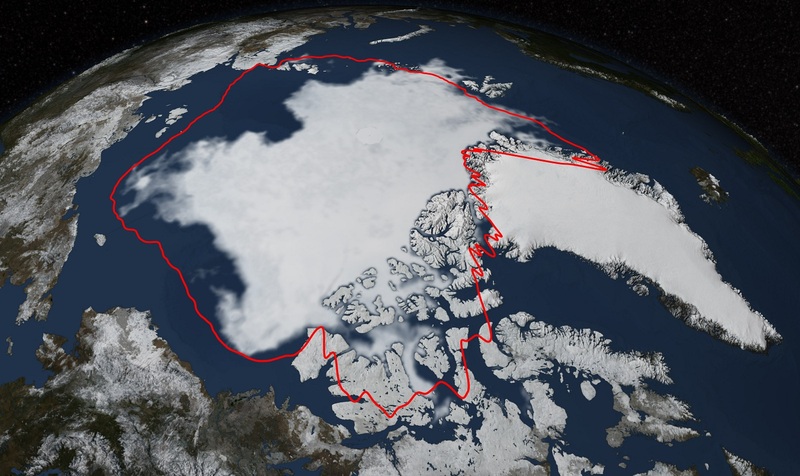 Satellite data show that ice melt has speeded up since 1979. Several of the glaciers in Svalbard have shown a negative mass balance every year since 2000; in other words, there is an annual net loss of ice, and they are shrinking in size. In 2012, a record level of ice melt was recorded in the Arctic. There has never been so little ice cover since satellite measurements started in 1979. Observations showed 700 000 km2 less sea ice than at the previous minimum in 2007. This satellite image from NASA (NASA/Goddard Scientific Visualization Studio) shows the extent of the sea ice on 17 September 2014. The red line shows the average minimum for the last 30 years. It has been suggested that global warming may result in cooling at northern latitudes. The reasoning behind this is that weakening of deep-water formation could reduce the strength of the Gulf Stream, which maintains temperatures in Norway at a level 5–8°C higher than would be expected at these latitudes. The fourth polar year, IPY 2007–08, involved field work and data collection from March 2007 to March 2009. Previous polar years were organised in 1957–58, 1932–33 and 1882–83. All the polar years have resulted in the collection of valuable material and data sets and led to advances in scientific knowledge. Analysis of the results continues for many years after the field work. Climate change was the main focus of IPY 2007–08, which was an intensive, coordinated international and interdisciplinary research programme. The data and samples collected will make it possible to improve climate models and projections. The Research Council of Norway allocated NOK 288 million to polar research in the period 2007–10. About two-thirds of the funding was for meteorological and climate research. The results of IPY 2007–08 are making an invaluable contribution to knowledge of climate processes in the Arctic and will provide us with a better basis for assessing the impacts of the changes that have already been observed.